Knitting Relaxes Me: It's a yarny miracle! Remember how Honeybee was in time-out, while I tried to figure out how to deal with the shortage of Wooly Wonka Merino Laceweight in Northern Lights? Well, I pulled Honeybee out this afternoon and decided that I would do half as many repeats of the two end sections at this end and just not worry about it. Honeybee is worked from the center out, but no way am I going to rip out the other end to make it match! I finished a repeat of the first end section and started fishing around in the knitting basket next to me to find the lace-weight cashmere (left over from my sister's Wine and Roses Mitts) that I've been using for lifelines. And instead of the cashmere, I pulled out --- more Honeybee yarn!!!!! The little ball in front is what I thought I had left. The one in the back is the one I found. Missing is the "cigar-shaped wad," since found. 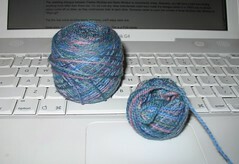 I had totally forgotten than when I wound the giant skein, it broke! I've never been happier about broken yarn! And when I was looking up that post -- because once I saw the little yarn cake, I was sure I had blogged it -- I was reminded that there was also a little "cigar-shaped wad." I just found it, too! Did you get some miracley sounding music playing and did the yarn start to glow? Very cool! Isn't that wonderful? I thought I was going to have an 8" scarf - went to look for something else and found three more skeins in my stash! (And yes - it was glowing and I heard harp music!) I wonder if I'll ever get organized enough to list my stash on Ravelry?